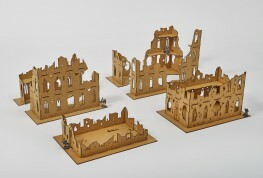 Small Set of destroyed and ruined Gothic buildings. Dedicated to wargaming in 28mm (1:56) scale and games like Warhammer 40 000 or Bolt Action. Model allows to set figures in the middle of the building. 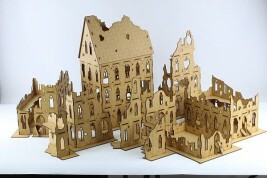 Medium Set of destroyed and ruined Gothic buildings. Dedicated to wargaming in 28mm (1:56) scale and games like Warhammer 40 000 or Bolt Action. Model allows to set figures in the middle of the building. 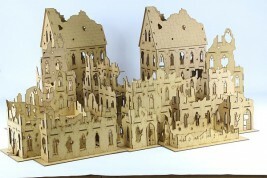 Large Set of destroyed and ruined Gothic buildings. 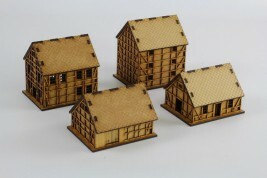 Dedicated to wargaming in 28mm (1:56) scale and games like Warhammer 40 000 or Bolt Action. 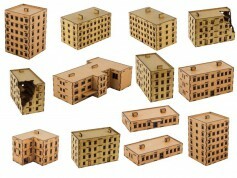 Model allows to set figures in the middle of the building. 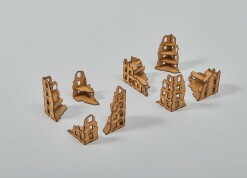 Small Set of destroyed and ruined pieces - corners of buildings, dedicated to a scale of 20mm (1:72) Set allows you to create interesting space defense of the city. Model designed by the architect, made with attention to detail and finish - visible outline of decorating the facade of windows and door frames.